The comic book adaptations of all six Star Wars films are fairly straightforward and faithful for the most part, but there's a disturbance in the Force when it comes to A New Hope. Much like the current retooled incarnation of its film, the comic book includes Lucas-friendly, fan-despised deviations from the original film such as Greedo shooting at Han Solo first in their Mos Eisley cantina encounter and Solo's scene with a mobile Jabba the Hutt in the spaceport. That's entirely due to the production timeframe of the book. While Empire is derived from the Marvel Comics series run during that film's premiere theatrical release, and all of the other adaptations were produced around the same time as their films, the New Hope adaptation included here was made in conjunction with the Special Edition theatrical release of the film. Fans longing for the legendary pencils of primary original series artist Al Williamson needn't despair completely though, as he was called in for inking assistance on the project over Eduardo Barreto's capable pencils, linking the book's look well with Episodes V-VI. Those two books got an upgrade as well, but seemingly only in remastered coloring rather than any tinkering with the plot. There's no consistency with the art chores in the prequel trilogy, with different artists on each book, although Williamson returned for full inking duties on Phantom Menace. Episode III has the best art of the three, with an almost painterly approach to the art that gives it added depth. Episode II was my least favorite, primarily due to its depiction of Yoda that made him look more like the hokey Empire Muppet rather than the badass CG marvel he was in that film. All three books are completely competent though, so there's no reason to rule out the Omnibus due to any quality concerns. 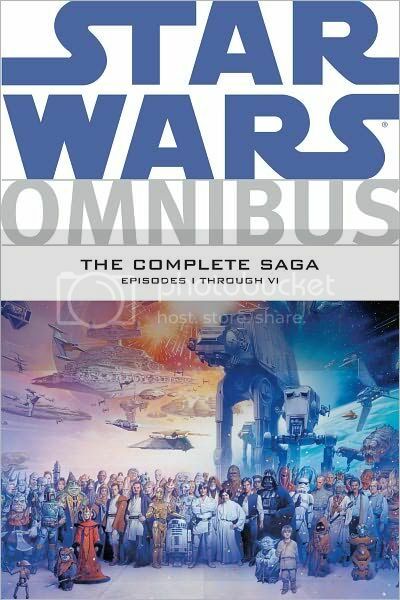 The Omnibus collects all six adaptations in one massive 600+ page book, with nothing in the way of special features except for the inclusion of individual cover art pages for each adaptation. At a list price of $25, it's hard to grouse about bang for the buck. The publication date is listed as October 4th, but it's already available on Amazon and other sellers. For more information, visit the Dark Horse Comics website.